After successfully launching their innovative projet de marché in the Summer of 2011, the association Marché sur l'Eau is back! The maiden voyage of 2012 took place on May 1st and this year the market is more ambitious, promising a year-round presence in front of the Rotonde at Stalingrad. 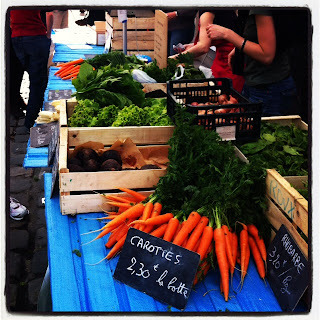 I love the idea behind this marché- which brings local produce from the Seine and Marne region to shoppers in Pantin and Paris. Boats are charged with seasonal produce grown by independent producers and then make their way towards the city using the canal de l'Ourq. The boat is able to do the work equivalent to 10 trucks, making it an ecological and functional alternative to truck delivieries. The transport is what happens behind the scenes- but what the consommer sees once the stage is set is just as exciting and enough to get you engaged. 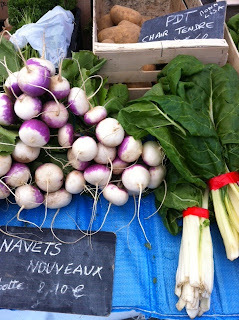 The produce is gorgeous and very resonably priced. For €7,20 I picked up 2 heads of lettuce, a huge bunch of bright orange carrots, and a hearty helping of blettes. You can visit the market and choose your produce on Saturdays and Tuesdays, or you can sign up for a panier which will be prepared and waiting for you on market days. 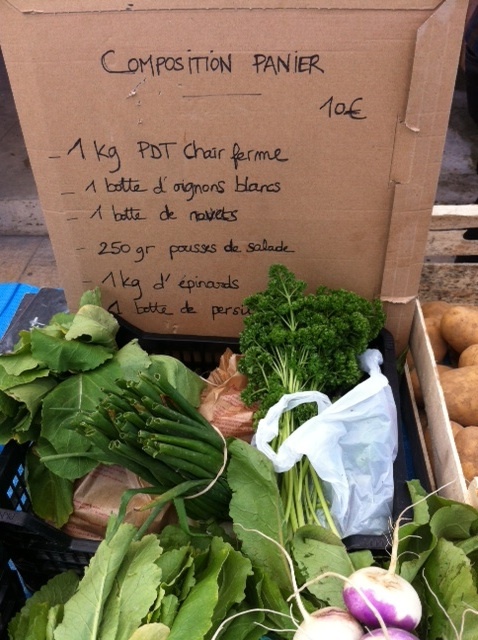 Panier prices range from 9-15 euro in Winter and 10-17 euro in Summer. 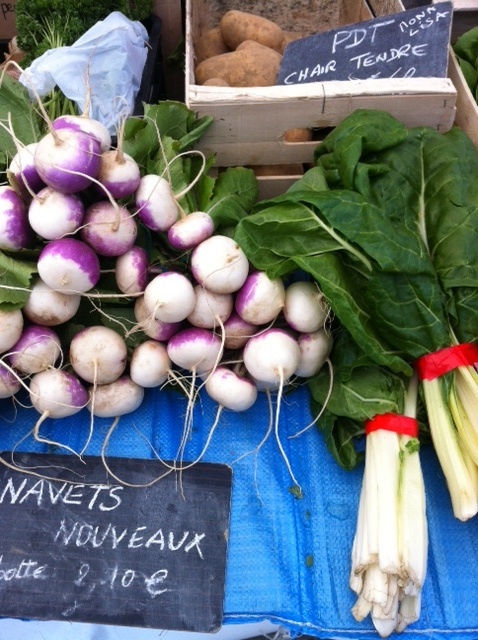 Your account can easily be managed through Marché sur l'Eau's website and you can modify your pick-up days or reschedule in case you're out of town or otherwise unable to pick up your veggies that week. A typical winter panier includes potatoes, green onions, spinach, and parsley. Things promise to brighten up in the warmer months, when zucchini, bellpeppers, heirloom tomatoes, and eggplant get into the mix! The Marché us staffed by members of the association that are eager to talk about the project- so if you have any questions I highly recommend checking out the Marché sur l'Eau and learning more about what they're about!